This is one of those projects that is not only amazingly fun to construct, but the end product is amazing to see in action. 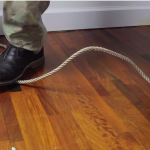 By using an old bicycle tire, inner tube and catapult rubber, you can construct a compound-like bow that is inexpensive, has a rigid frame and great power output. It also is lightweight, accurate and very simple to build. The range is about 60 feet and would be perfect for hunting small game and fish. 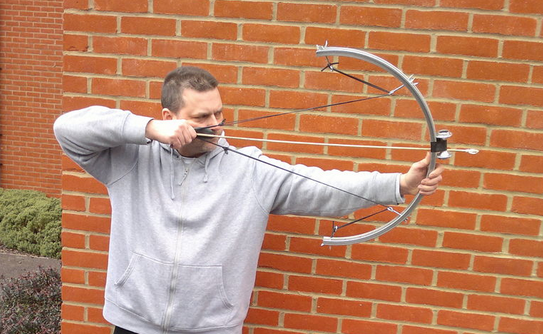 This type of bow would be perfect in a survival situation or to hone your skills at shooting arrows short-range. It is also the type of weapon you can make in almost any SHTF situation, because bicycles are everywhere. To see how to Make This Epic Bow From A Bike Rim! Looks more like a slingshot.